According to the recent “Indian Telecom Services Performance Indicator Report” for the Quarter ending March, 2013 by TRAI, Idea Cellular has added the highest number of wireless subscribers in Jan – March Quarter followed by Bharti. 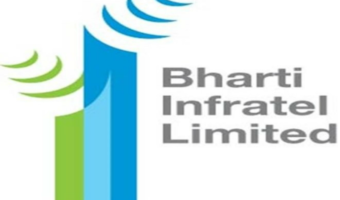 However in terms of total wireless subscribers, Bharti remains the leading operator with 188.20 million subscribers at the end of Mar-13, followed by Vodafone (152.35 million) and Reliance (122.97 million). The number of telephone subscribers in India increased from 895.51 million at the end of Dec-12 to 898.02 million at the end of Mar-13, registering a growth of 0.28% over the previous quarter Dec-12. Out of the total 898.02 million subscribers, 867.80 million are wireless while 30.21 are wireline subscribers. 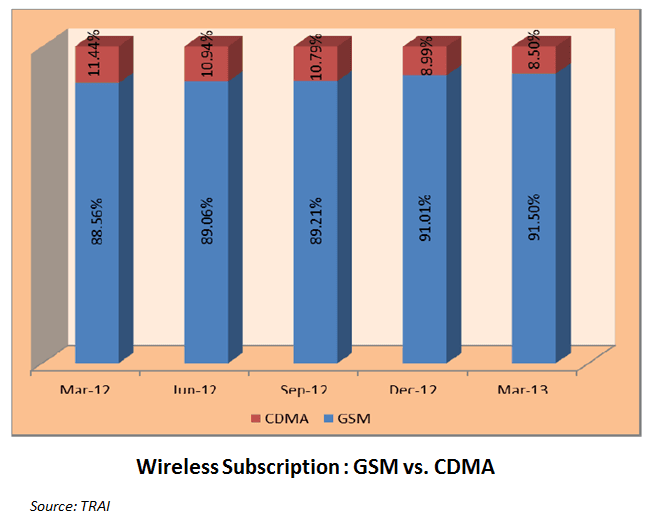 Total Wireless (GSM + CDMA) subscriber base increased from 864.72 million at the end of Dec-12 to 867.80 million at the end of Mar-13. 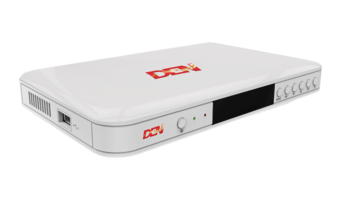 Thus, India recorded a net addition of 3.08 million subscribers in the period from Jan-March, 2013. Out of the total wireless subscribers, GSM subscribers constituted 91.50% of the wireless market. The CDMA subscriber base further declined at the end of Mar-13. Reliance continues to be the largest CDMA mobile operator. Coming to service area, UP (E) has the highest number of wireless subscribers as of March 2013, closely followed by Tamil Nadu (including Chennai) circle. 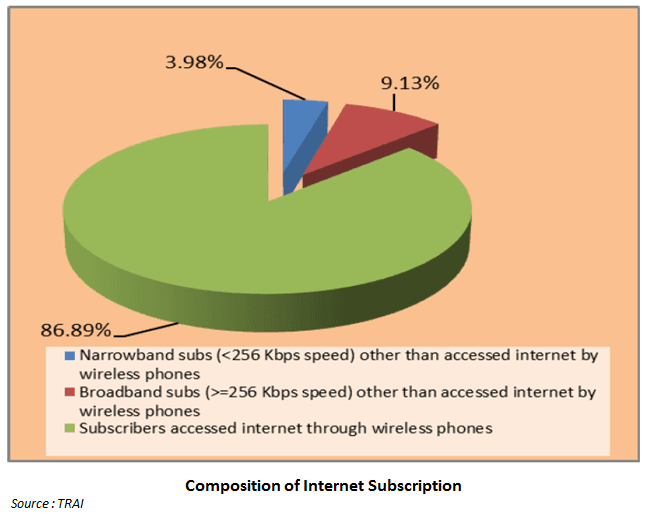 Wireline subscriber base further declined from 30.79 million at the end of Dec-12 to 30.21 million at the end of Mar-13. Total number of internet subscribers including internet access by wireless phone subscribers at the end of Mar-13 stands at 164.81 million. In the month of Mar-13, 143.20 million subscribers accessed internet through wireless phones. 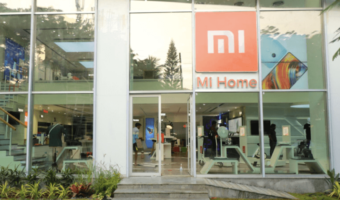 Bharti Airtel is a leading service provider with market share of 27.58%, followed by Vodafone and Idea Cellular in internet access by wireless phone subscribers at the end of Mar-13 (This does not include the subscribers of BSNL, MTNL, Quadrant and Videocon). Monthly Average Revenue Per User (ARPU) for GSM service increased from Rs. 98 in QE Dec-12 to Rs.105 in QE Mar-13 . Im very much happy with the service. I will be more happy if ‘idea’ itself tells(sms) me about the latest and advance plans so that I will save money and benefit maximum. Send SMSs so that subscriber will benefit.